OPI just launched another new product at the end of 2011 – OPI LED Gelcolor. Although it is Soak Off Gel, many improvements have been introduced to this brand new product line. You will definitely be surprised by how much the OPI LED Gelcolor is better than the previous OPI Axxium Soak Off Gel in terms of easier to use, shorter processing time and longer lasting glossiness. OPI LED Gel Color works the same as the previous version, which buffing of real nails is NOT necessary, and the Gel can paint onto your real nails directly; To remove, you just need to soak in “Expert Touch” for 15 minutes. What’s the difference between OPI LED Gelcolor Lacquer and OPI Axxium Soak Off Gel? 1½ – 2 hours was needed to complete a whole set of OPI Axxium Soak Off Gel. But thanks to the new LED light technology, it only takes around an hour to dry the Gel which is just half of the time needed. Refined top coat makes your nails glossier and last longer. Unlike the OPI Axxium Soak Off Gel which needs a stirrer to mix the Gel, OPI LED Gelcolor is stored in a bottle with brush. This new feature, doesn’t directly benefit client. But for the nail technicians, it is much more convenient to mix the Gel by simply shaking the bottle. So indirectly it speeds up the process and ensures the smoothness of the Gel. Yes, there is the forth feature —- the matte finishing: Compared to glossy finishing, matte finishing could only last for around 2 days which is a bit too short, as the protective top coat is absent. But matte finishing in the Soak Off Gel series looks infinitely better than the regular collection polish! So if you want to keep the matte finishing color, OPI LED Gelcolor is definitely something you cannot miss! Another big improvement to this new OPI LED Gelcolor series is the brand new LED lighting system. What makes it so special? The key point to the whole system is the LED Light. It can solidify Gel in as little as 30 seconds! Plus, 32 LED light bulbs spread evenly in semi-circle that covers every angle of each nail, including the thumb. Therefore the machine can now take care of different nail shapes thoroughly (e.g. curvy, slanted nails). Another exciting feature of the LED system is its automated sensor. Light will be on and start counting automatically when your fingers touch the sensor! So you are free you attention to do whatever you wish to concentrate on something else. Lastly, there is a new design for pedicure that it raised the system. It increases space during the drying process. You can’t wait to try the all new OPI LED Soak-Off Gel right? 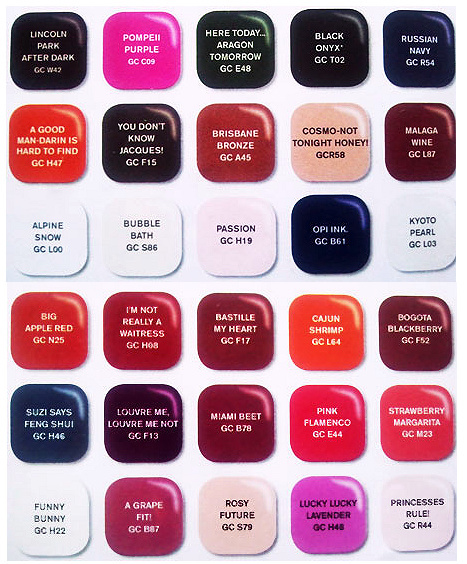 The first round of 30 colors has already arrived at Rainbow nails! Colors ranges from light to dark, sheer to shimmer. There must be one which can fit you. [Updated]: More Colour Sample can be found here!